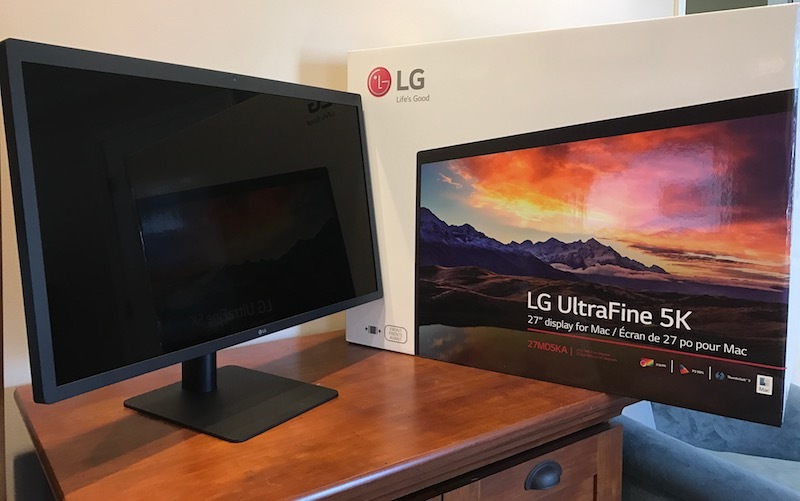 LG's UltraFine 5K Display returned to the market earlier this month after LG made some changes to the display's shielding following the discovery that the original design left the display vulnerable to interference from Wi-Fi routers and other electronics. The issue was a bit of a black eye for Apple, considering the company recently elected to exit the display market and instead partnered with LG on the new 27-inch UltraFine 5K and its smaller sibling, the 21.5-inch UltraFine 4K. We purchased one of the original UltraFine 5K units back in December, with our model carrying a manufacturing month of November 2016 based on its serial number. LG has now provided us with a unit manufactured last month after the design revisions were put in place, and we've had a few days to compare the performance of the two units in the presence of Wi-Fi routers. In day-to-day usage, we failed to see any issues with the original model, even with an AirPort Time Capsule located just three feet from the display, inside the two-meter radius LG recommended users should keep as a minimum once the company discovered the issue. We were, however, able to induce the issue in the unit by bringing another Time Capsule into very close proximity with the rear of the display, causing it to flicker and disconnect from the host computer. The display sometimes reconnected to the computer on its own once the interference was removed, but other times it required that the Thunderbolt 3 cable be briefly unplugged or even the entire UltraFine 5K be power cycled before it would reconnect. With the revised UltraFine 5K Display in hand, we've been able to subject both displays to side-by-side testing that confirms the issue has been successfully addressed. While the issue is easily reproducible on the original model as long as the Wi-Fi router is in close enough proximity, we were unable to recreate the issue on the revised model despite extensive efforts. With Apple once again shipping the UltraFine 5K Display, new orders are currently showing in-stock availability in Apple's U.S. online store, although Personal Pickup remains unavailable. Apple's discounted pricing on the display of $974 is scheduled to run through the end of this month, at which time the display will return to its normal $1299.95 price. Apple already extended its discounted pricing on USB-C and Thunderbolt 3 accessories once and it's possible the promotion could again be extended, but for those who want to make sure they receive the discounted pricing, they should be sure to order by March 31. Customers purchasing the UltraFine 5K Display, regardless of what vendor they use, should make sure they are receiving revised units to ensure they are protected from the Wi-Fi interference issue. The first three digits of the display's serial number (visible on the exterior of the box) correspond to the last digit of the year and the two-digit month of manufacture, so buyers should look for serial numbers starting with 702 or 703. Those who purchased earlier units may be eligible for repairs if their units are exhibiting the interference issue, and affected customers should contact LG or Apple for information on repair procedures. We've arranged for a repair of our affected unit through the live chat option. Once the repair request is initiated it can take a day or two to receive a shipping label and repair details, and LG tells us it can take up to 7-10 business days for the actual repair once the display has been received at the service facility. Still an awful mess of a display. Should have nothing to do with the Apple brand whatsoever. Completely off brand. I'm still bummed that Apple never made its own 5k Cinema Display. Wish they didn't abandon it. Would be nice to have the same quality external screen to match my Apple MacBook Pro. Oh well. I’d pay 25% more for this display, in an Apple enclosure. LG does make excellent panels, and my 65” OLED LG TV is in an arguably very attractive enclosure (even nearly Apple worthy), so I’m sure how this montior got out of the industrial design room. Even though it was a botch job, it is commendable they owned it and addressed it instead of hiding in secrecy/being in denial. I just don't like the look of the display. I'm sure it's nice, but it doesn't have that Apple fancy I'm used to. It looks plain and boring. Great, so glad this is now sorted. Now how about a modern standalone Mac desktop computer that can actually drive a 5K display? Honestly, I think plenty of us would be fine with an updated Mac Mini using some of the guts from the new Macbook. That big top bezel? I don't notice it unless I'm looking for it. And in regards to that big top bezel... has anyone else noticed that the new MBP's top bezel is about the same proportion as the LG 5K's? It's surprising that nobody's complained about that given how much of a roar there was about the 5K's bezels. Exactly. When I first saw it in store I didn't think it was the LG 5k. It's a non-issue proliferated by people who have never used or even seen it. I had the same reaction when I saw the first product images but I can assure you in daily usage the bezel is literally invisible. See attached. I'm guessing you haven't bothered to see and use the display in person. It is a quality product, and the "brow" everyone criticizes looks the same size as any other monitor.